It’s great to be back and looking forward to finishing out the year. I’ll be staying with marine/beach theme for a while longer as I continue to work out how to effectively paint sand, sand dunes and grass with oil pastels. While the concentration is on the beach and sand, there will be a wave painting or two to post. Most of the break has been spent experimenting with colors and techniques to achieve convincing sand features, there is more work to do but in the meantime, I hope you enjoy my latest wave painting . . . The Curl, that is an oil pastel (6×6) painted on an ampersand board. There is something magical about the powerful of the sea and the art of the wave – Mother Nature sure knows how to bring it on! Can’t help but love this ampersand as a support board, as it’s a great texture for grabbing OPs and awesome with wet underpaintings which is what I did for The Curl. The darks were achieved with Holbeins indigo blue and a touch of Senns Sap green. This little painting was done with a series of layers and minimal blending, using mostly Mungyo-Gallery brand cool colors and a bit of Holbeins warmth in the top portion of the curl. A painters knife came in handy for smearing the texturing the sea-foam. Reference image was from Dana Critchlow an awesome photographer and artist with pmp. This entry was posted in About Oil Pastels, OPs New Paintings and tagged art, fine art, ocean, Oil Pastel, painting, wave. Bookmark the permalink. I try to paint something daily for my mental health this is going to take a back seat after Wednesday if I have to move my home to her home for her to be at peace. I have just reblogged this one. Gorgeous! Such movement and color and it reminds me of some Japanese art featuring waves. And good for you for reminding people your art is your property! Thank you so much for your feedback – interesting about the Japanese art. The medium, oil pastels, is perfect for building individual wave scene – for rich colors and blended tones when needed. I’ve had problems with my images being taken, which is why I post the reminder – hasn’t totally stopped, but have noticed a significant drop. Nice to meet you! I always ask someone if I can download their art before doing so. It’s good manners, let alone the copyright issue. Mary, this is so beautiful! You have really captured the movement of the water. Love the colors, especially the subtle green hues in the blue. It looks so real I want to run to the beach right now! I hope all is well with you and that you have a wonderful weekend! Hi Dsaquarelles, thank you so much for your lovely feedback!! Have a wonderful weekend. This is one of the most beautiful seascapes I have seen…bravo!! Thanks Rita for your generous response to The Curl – glad you enjoyed the scene!! Perfect, awesome Beach Boy tune to “catch a wave!” So happy to see you again – glad you liked the piece. Time to go out and catch a wave!!! Thanks very much Gallivanta – so great to see you again! It is real nice being back and working the paints! Fabulous! One of these days, I would like to re-blog one of your works, if OK by you! Thank you Ashok for your lovely feedback on the wave – I really appreciate it. If you reblog, could you let me know. Thanks so much and nice to see you! Sure, will do so. Pleasure is mine. Wow, Mary! I can almost hear the sound of the waves pounding the beach! Excellent painting skills! That is an impressive curl!! Thanks Susan! Nice to see you again ~ hope you’ve had time for some painting this summer. No I am sad to say life is getting in the way of having fun at my easel. You’re doing beautiful work, Mary. Not that I’m saying anything new there. Looking forward to more of your waves and beach scenes. I find all of this very challenging, but it’s just the kind of subject I want to be painting, eventually. Well done! Thank you so much, appreciate your nice feedback. There is no doubt that before long you too will be painting waves and beach scenes, because you are well on your way with the paintings that I’ve seen you produce. Just remember that water is no different than any other subject, values and forms – no question that you could do one today!! Have fun and experiment. Your welcome and it’s something I have to constantly remind myself of ~ will have fun with you in creating!! PS – it really is nice to have you back!! Mary, it looks like the frame has been paused and any second will start up again – there is so much energy in this work. I love it! Thanks so much for your lovely comment – means a lot to me. Wanted to let you know that I found your comment in spam. Thanks again and hope you have a wonderful weekend. Oh shoot. Well I am glad you found it. Your work is so beautiful. Gifted and loveliest Mary!! So happy Jo! Thanks very much and always pleased to bring some joy to you! It’s such a pleasure to see you back Mary. A beautiful painting! Thank you James so much, it is great to be back – appreciate your nice feedback!! what a gorgeous use of cool palette, I love it! Hi Pauline – ha, could only stay away for so long!! Thanks very much for you thoughts on the piece, I used a palette knife for the whitecaps – it allows for a clean sweep w/o blending. This is wonderful work Mary. To capture a wave like that is not easy. So well done. Ah, I see you have been painting up a storm. Excellent. I really like this one, Mary….that dark blue under the curl is the perfect accent and your foamy froth is just deliciously appealing….I don’t even like swimming if it’s not a a pool, but I’m ready to jump in! Hi A! great to see you again! Thanks very much and glad you like the wave – the froth was a lot of fun to work on smashing and smearing the oil pastels with a palette knife!! Mary, you sound positively possessed….what a visual statement! I love it! Capturing waves, and all their movement, is really tricky. This is beautiful, Mary. I am glad you enjoyed successful progress during your hiatus. Perhaps you’ve painted a curl from Poseidon’s beard, or a curlicued lock of hair from one of his many lovers. I was beginning to wonder what I’d do for a Holbeins indigo blue fix while you were away… so welcome back. Hello awesome Prospero! Ha, “Holbeins indigo blue fix” – love it. Yes and so like you to mix a sea adventure with the main focus, works totally – thank you so much. Well lets see, it’s delicate enough – we’ll stay with the curlicued lock of hair!! What a marvelous curl! Welcome back, Mary. We missed you! Thank you my friend, great to see you Elena – thank you so much for your kind feedback! Welcome back, Mary! 🙂 The curl of the wave is brilliant. Beautifully done. Thanks Amy – so great to be back too! Appreciate your kind comment on The Curl – was a fun exercise to do. Thanks so much Fiona – great to see you again! Fabulous! The Curl brings me back to my childhood when I was playing in the ocean and one of those curls knocked me down. I stood up and was mortified to see my bathing suit bottom around my feet! Geesh! Love your marine themed pieces Mary. Glad to see you back. Have a super week! What a great story Rhonda – so funny, the power of the wave. Glad you enjoyed the piece, it’s feel so good to be back at it. Thanks so much – have a wonderful week too (loved your latest painting!). Making waves! The perfect summertime post, Mary! YES. You’ve been missed! Had me smiling there Cynthia – thanks very much! Great to be back and painting again. Always lovely…. I hope you’re enjoying your break Mary, it’s well-deserved – you work too hard 🙂 happy for you and I’m sure you’ll return even more inspired… take care, dear. Great to see you Heath! Thanks very much my friend – the break was good to get the creative energies flowing again. Hi Sarah, so great to see you again! 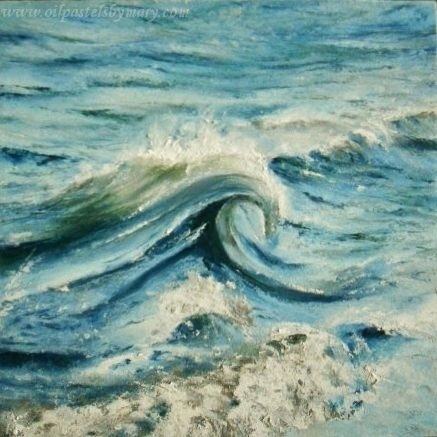 Thanks very much – I’m drawn to the water and I find it fascinating to paint waves. I saw that you had to re-follow, odd right? Hope you are well with the turmoil over there. Thanks so much Jackie for your lovely comment and compliment. Glad to be back and see you again! So good to have you back, Mary and what a grand entrance! What a majestic curl! Welcome back, Mary! I missed your beautiful work. Beautiful painting Mary. Welcome back. Thanks Geralyn – happy to be back!